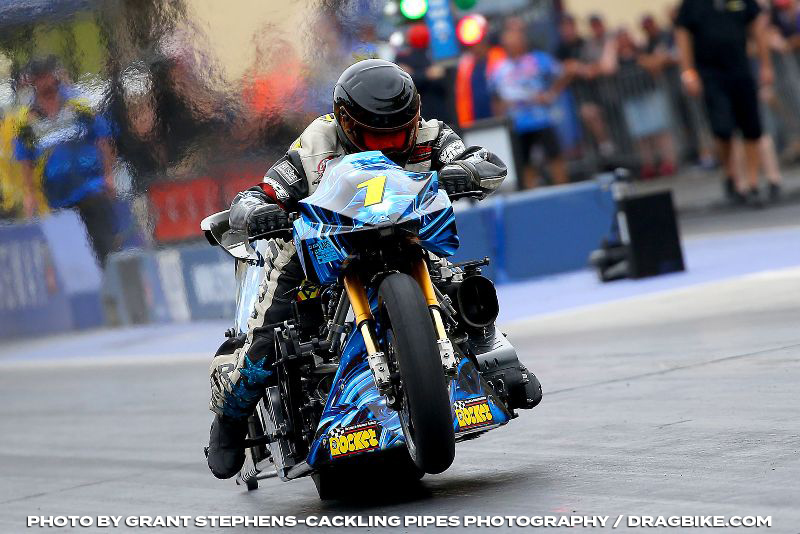 Australian Top Fuel Motorcycle No.1 plate holder Chris Matheson continues to develop his record holding, nitro-burning 1500hp + machine to try and achieve quicker times over the quarter-mile (400 metres) race distance. Matheson said, “We have been looking at changes to the bike for some time and have used the extended break between championship rounds to implement the upgrades. In this sport, you can’t sit still and we are moving into an exciting phase. “We have been refining our cylinder head flow through porting and valve size, along with changes to our exhaust pipe size and length. “Our recent runs in the heat at Sydney Dragway’s Santo’s Summer Thunder (January 18 & 19th) saw improvement, so its pleasing to see our efforts have shown some rewards. “We have designed a new supercharger plenum to couple to the cylinder head design, which will complete the overall improvements to that part of our engine development. “This combination will help the bike accelerate over the middle and back end of the track if our theory is correct,” continued Matheson. “We are also trying a hi-tech ignition system that will (again in theory) allow us to control our 1500 horsepower bike more smoothly in the first half of the track to launch the bike on the run. “The ignition is expected to be smoother and has more options than what we have been running in the past. “Our focus is to run quicker in a shorter distance thus giving us more breaking area to stop the 400 plus kilo bike! “We are in the process of installing the upgrades in the Nitro Voodoo race shop and will be ready to test our theories over the next couple of weeks before our next 400 Thunder Top Bike Championship round at Willowbank Raceway’s Santo’s Super Thunder April 19th. Matheson recently travelled to Sydney on for the Sydney Jamboree and had hoped to test out the upgrades to his record holding Nitro Voodoo Top Fuel Motorcycle. “I arrived at the track on Wednesday, while the crew who are spread from Western Australia and Queensland, would arrive on Thursday. Unfortunately, wet weather got the better of us and set in for the weekend. So rather than sit around and watch TV, we used the time well and went back to school,” grinned Matheson. “I wanted to go over all the changes and upgrades to the bike so to familiarise my crew with all the new stuff. We were able to use a function room at the Atura Hotel and go over the info on our laptops to bring everyone up to speed. While this season has thrown a few curve balls to Matheson, he is feeling confident that the recent development and changes will show rewards as he closes in on the 2018/19 championship with just three rounds remaining. When asked if this was the right time to be developing? “When isn’t it the right time,” grinned Matheson. “The race is on to record the first five-second run on a motorcycle over the quarter-mile and we are focusing on running quick. We are seeing a renewed interest in Top Bike here in Australia with the return of riders and new bikes. The clock is ticking and we don’t want to miss out on making Australian history. Chris Matheson Racing is proudly supported by the following sponsors – Kitten Ultra, Rocket Industries, CRC, Web Cam Racing Cams, Larry McBride, World Wide Bearing Company, Boninfante Friction Inc, Performance Decals & Signage, Bill Furr Orangeburg Cycle Racing, Hi-Side Leather Repair, Performance Wholesale, GT Radiators & Machining, Boninfante, Great Southern Diesel Services, Aeroflow Performance and Ballistic Performance Parts.